The second annual “Carnival of Science” was a big success. The Carnival of Science is not a science fair. It is an all-out, get dirty, try things out kind of science fun! It is intended for all ages… Booths are put on by students, staff, community members, and groups. This year the Olympic Coast National Marine Sanctuary brought Big Mama; a large as life inflatable, explorable humpback whale, and the Forks Public Library came and taught people how to make Jitterbugs. The school had booths from many students grades 6-12, as well as booths led by the after school program, and some staff members. 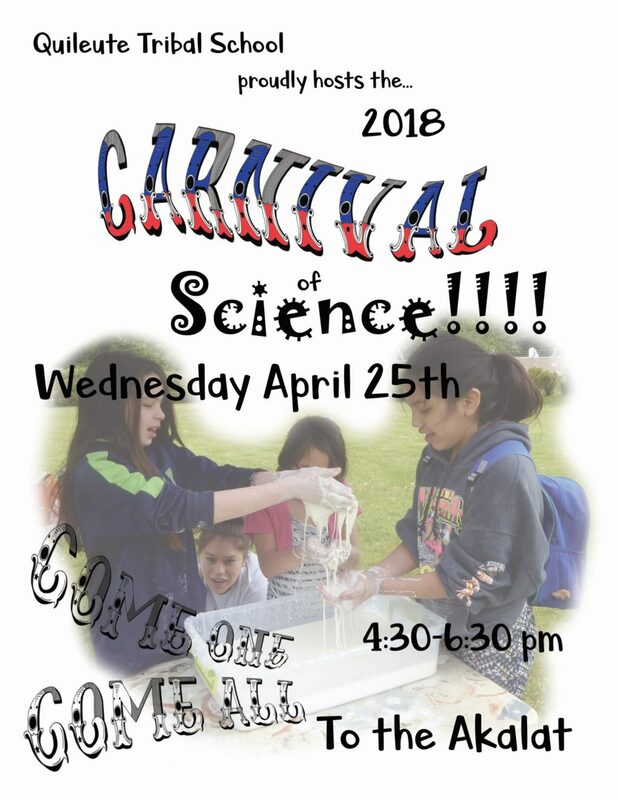 People could come and make a bouncy ball, play with a non-newtonian liquid, or try to build a bridge out of popsicle sticks and masking tape that will hold the most weight. The 2018 Quileute Tribal School ROV team was there is a simpler ROV that people could try driving around underwater in a pool. They are preparing to compete in the ROV competition in Forks on May 19th. Thank you too everyone who participated and helped us to share the natural excitement of science and exploration.